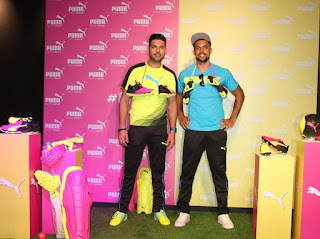 Mumbai, 21st April, 2016: The Fastest Global sportswear brand in the World PUMA, along with Yuvraj Singh and Robin Singh revealed Tricks, a new colorful interpretation of its evoPOWER and evoSPEED spike, in pink and yellow, made for those who like to play loud. The new eye- catching Tricks collection was unveiled today at PUMA’s Linking Road store in Mumbai. The dual color Tricks collection is designed for high performance on the field for football and cricket. The Tricks collection houses a wide variety of products that caters to two different sports cricket and football. The stars of the Tricks collection are the Dual Cricket Spike and the Football boots which are sure to turn heads during the major tournaments this summer. A mélange of style and performance, these evoPOWER cricket spikes have an upper that boasts a soft synthetic material whilst stability and breathability are provided by the fully fused mesh windows on the quarter. Anatomically engineered the one-piece outsole provides stability and support, utilizing high-tech materials to minimize weight and to maximize the stability and reactivity. With the pink left and yellow right the colors were chosen to make the players stand out in the field with great performance Pink Glo and Signal Yellow The Tricks evoPOWER 1.3 football boot keeps the principles of barefoot kicking at its core, with increased flexibility resulting in more kicking power. The Tricks evoSPEED football boot is light and responsive, to improve speed and maneuverability.